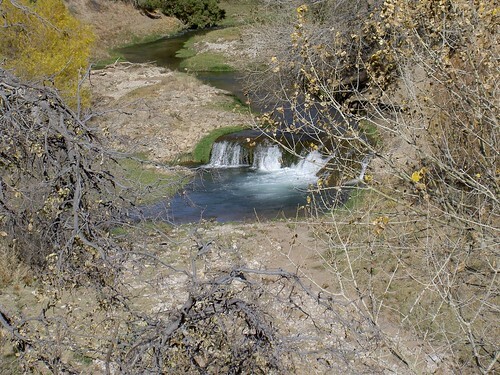 In the low desert mountains of New Mexico, meandering between the dry, brush covered arid hills, flows a gin-clear, trout-infested oasis of a stream. 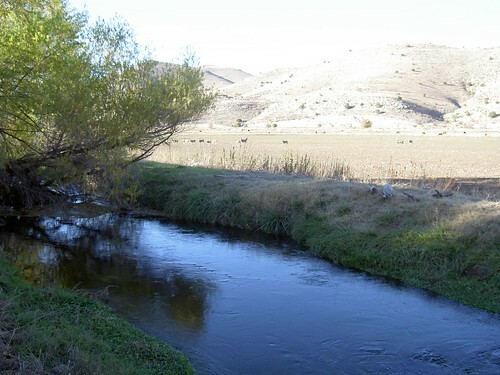 5 miles of the Rio Penasco are on Charlie Mulcock’s ranch about 10 miles outside of the tiny town of Mayhill, NM. The ranch has been in his family for 106 years. 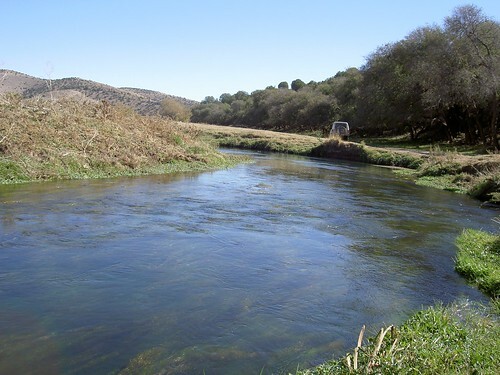 Recently, he started the Penasco Spring River Fly Fishing Club. 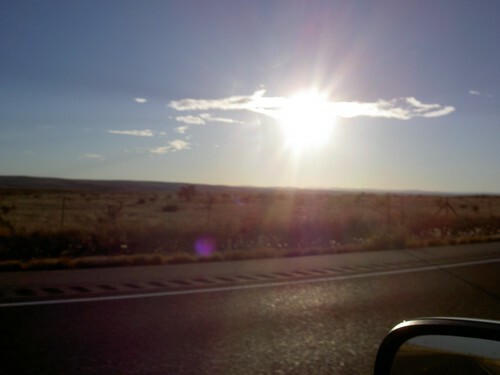 On Thursday, I made the 10 hour drive out to Alamogordo NM with my brother. David was there on business so it worked out perfectly. 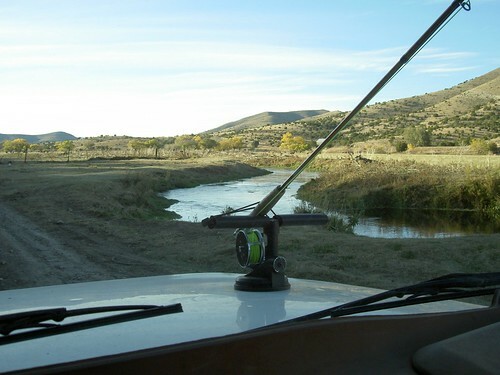 My plan was to fish on Mulcock Ranch on Friday and fish on some of the streams around Ruidoso on Saturday. The only flyshop in the area shutdown a while back so my Ruidoso trip was going to be based on a couple of books I got from Amazon. 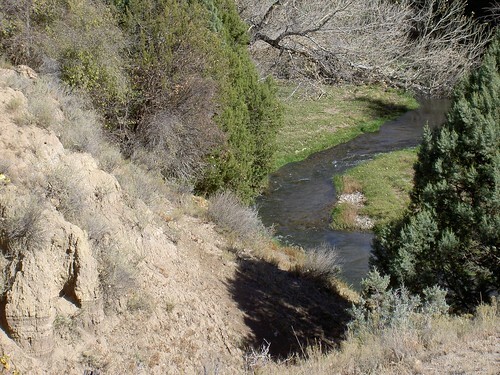 Both books warned that rivers in Southern New Mexico aren’t like western ones. 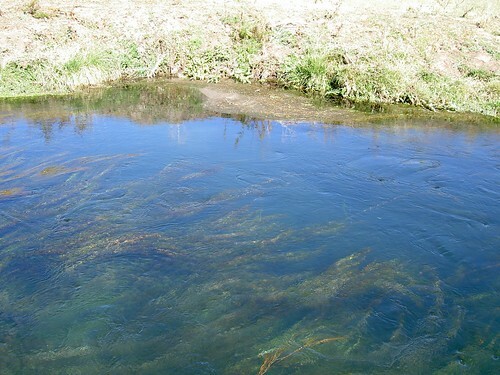 Many are seasonal and most can be stepped across without getting wet. 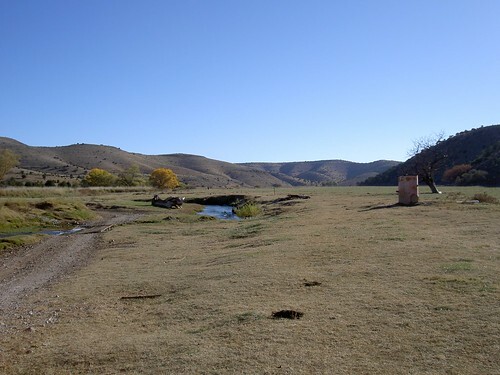 For some reason, I still had high hopes for Ruidoso area flyfishing. More on that soon. 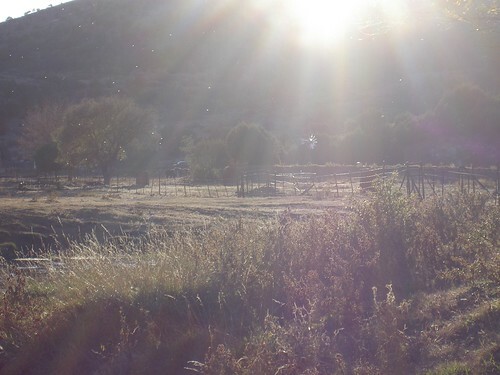 I arrived at the ranch on Friday around 8:15a. It was a cool morning in the upper 40’s but it didn’t feel chilly. Must have been my adrenaline. I drove for over 10 hours for this opportunity so I was beyond excited when I got to Charlie’s house. We exchanged greetings and went in to his house to talk about flies and look over an aerial map of his property. I brought 3 hodgepodge boxes which he determined held flies which should be adequate for the day. 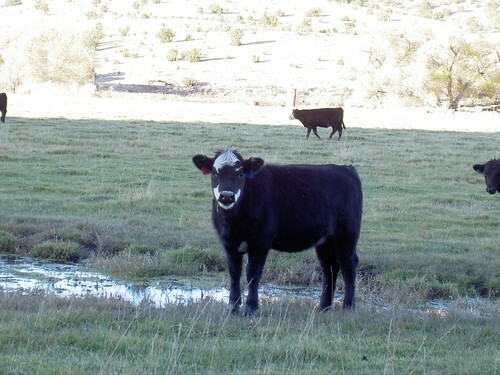 Charlie had about an hour of work he needed to accomplish with the cattle that morning so he showed me to the first spot at one end of the property. I initially tried a wooly bugger and nymph dropper. The water was deep in spots and only about 3-5 feet across. 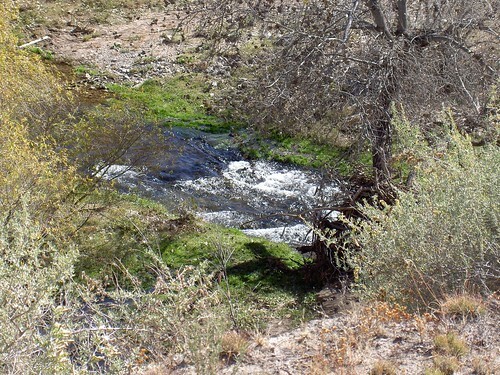 There was lots of great vegetation and clear water. I was definitely sight fishing for a change. Some really nice trout came out of hiding to chase after the combo but they would always refuse and return to their holding spot. I moved upstream and continued fishing. I ran across a monster fish under a high bank but couldn’t get him to even approach the flies. 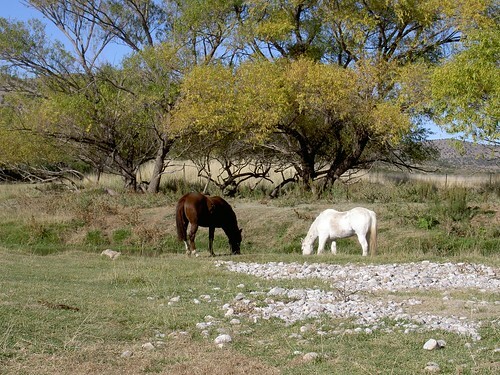 About this time, Charlie showed back up to show me the variety of water he had on the property. Following the tour, Charlie dropped me off with his 4 wheel drive Land Rover and I was on my way. 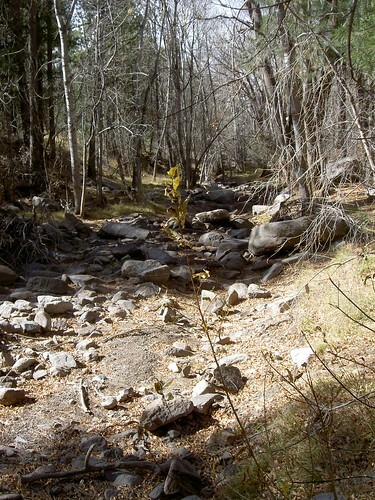 I started near the waterfall in the picture above and worked upstream. I never found an easy way to get into the canyon though with so much water, I decided to save it for another trip. 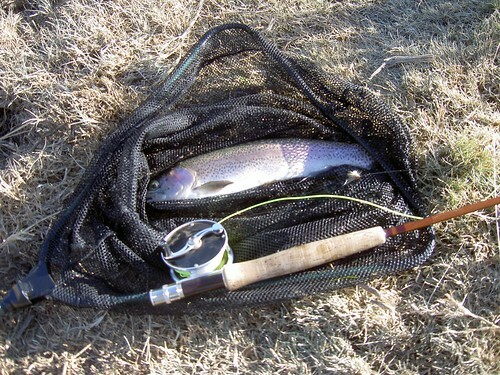 I ended up landing four nice sized Rainbows and long distance landed 2 others. I also hooked up a hog that broke my dropper off. I would have loved to get a better look but in my mind he must have been approaching 20 inches. Overall, the trip was very worth the long drive. Charlie was a wonderful host and I really wish I lived closer. I would join the club in a second if I didn’t have to take a 3 – 4 day weekend to utilize it. If anyone is looking for a very reasonably priced club to join, it’s worth the $100 to check it out. You’ll be very pleasantly surprised. Tell Charlie that you read about it on my blog. Now on to my second day. Not much to write home about since I never found water or water worth fishing. 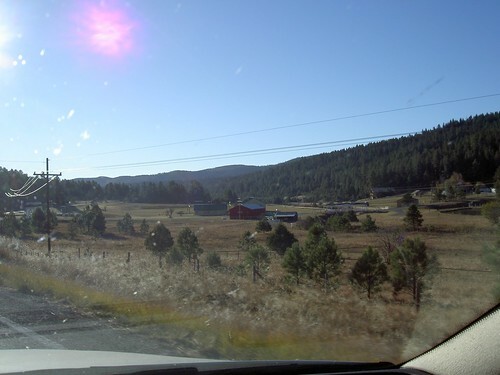 Ruidoso (as I was warned by some friendly locals who were on the ranch), was a dud. The Rio Riodoso was easy to get to but I could tell by a quick look down in a ravine, couldn’t sustain anything but trout from a truck. I’m guessing that they would have been fished out within a few minutes of being transplanted from the hatchery. Not my kind of fishing. Had a great trip overall and will be back to get that fish that took my bh nymph.